Many sports can be practised in and around Amsterdam. 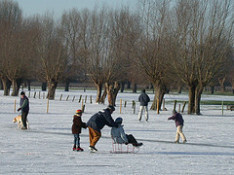 Hollands most popular sports are football, cycling and speed skating. Other well practised sports are tennis, hockey, volleyball and handball. Golf was seen as a sport for wealthy people, but is becoming more popular amongst the entire population.